The Bill of Material Manager is designed to relieve your Made2Manage users of the menial tasks which accompany Bill of Material (BOM) management. This feature embeds the routing right along with the BOM and at the appropriate level. No need to look up the routing separately. 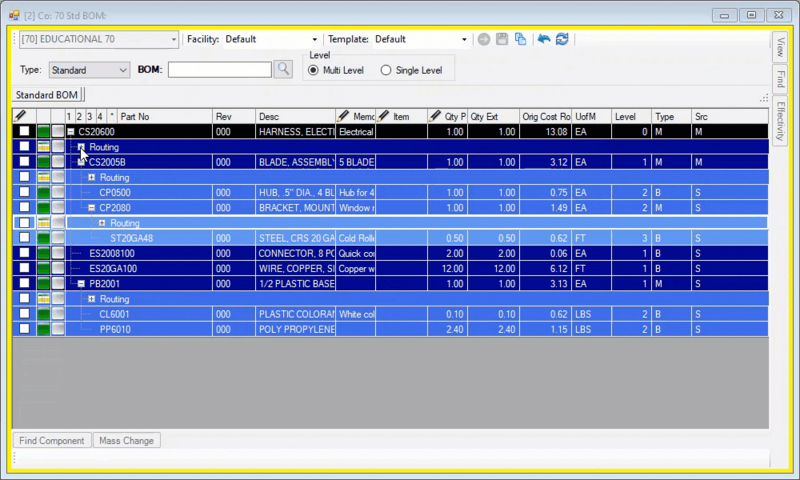 Easily edit Bill of Materials and routings through a drag and drop interface. For example, you can drag components (including sub-jobs) from a Job BOM into a Quote BOM. It greatly streamlines the input process without any key-strokes. Routings can also be dragged from window to window. Drag from any BOM type to any other. Drag the full BOM, or any portions of. Drag routings from one BOM to any other (regardless of type). Editing Bills of Material can be done directly on the BOM Grid in an Excel-like interface. Full security controls which users can view and edit the different BOM types. A dynamic interface immediately reflects what effects on cost a particular change will produce. The Where-Used functionality works across all BOM types (Quotes, Orders, Jobs and Standard). In addition to your typical single-level search capability, the Full Where-Used search looks at where the component resides within the complete product structure (component to top-most parent). Ability to search for multiple components (and/or logic). Immediate (single level) or Full (component to top-most parent) reporting levels. Highlights exactly where the components are used in multi-level BOM’s. Option to exclude Started and Obsolete Parents from search. Limit scope to just active (within expiration dates) components. Limit scope to product classes, group codes, customers, dates, statuses and more. When you’re viewing a BOM on the screen, it will print out exactly as you see it. If you have the second component on a BOM expanded and viewing its children, that’s how it will print. If you have a routing expanded on the screen, the routing will print on the report. Single-level or multi-level, what you see on the screen, is how the BOM will print. In the Bill of Material Manager, the Material List and the Routing become one. No matter what type of BOM you are looking at (Standard, Job, Order and Quote), the Routings are available at the click of a mouse, at any level of the structure. 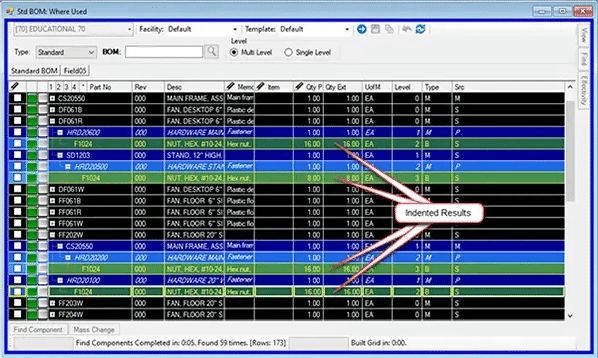 Whether you need a single-level view, a partially indented view, a fully indented view, or combinations of these, the BOM Manager can provide it (along with the routings). A WYSIWYG reporting module prints the BOM exactly as you see it on the screen. Again, across all BOM Types (Standard, Job, Order and Quote). Compare any two BOM's, whether they be two Standard BOM's, a Standard BOM and a Job BOM's, or an Order BOM and a Job BOM. The compare will compare both BOM's components and also the Quantity per for each Component. 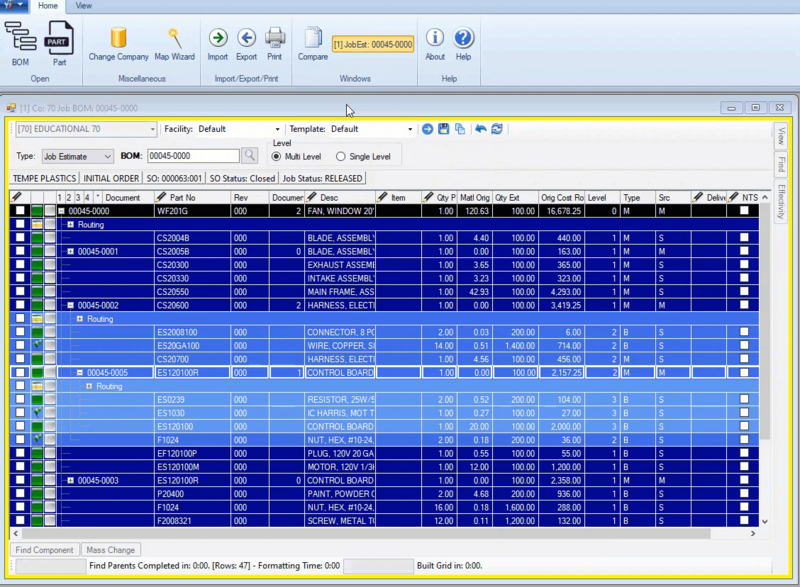 Users can select the relevant columns for each Bill of Material type they need. The BOM Manager will validate each component and present warning indicators as appropriate. Some of these indicators are: Not Current Revision, no BOM and/or Routing for manufacturing items, Expired Part, Future Part, and more. Uses Active Directory users. All modes of access (Read, Edit, Import) can be controlled per BOM Type (Standard, Job, Order, Quote). As well as the ability to add new Item Masters. Provides the ability to look for components starting with, or containing a value. Find all the BOM's containing multiple components. Use AND/OR logic to determine matching logic. Need to find all of the Parent Items containing a particular component, anywhere in the BOM? Or how about all of the Jobs which used a component in the last 6 months (even if the component resided in a stock assembly of that Job. The Bill of Material Manager makes this impossible task possible. This Advanced Where-used works across all BOM Types in Made2Manage (Standard, Job, Order, Quote). Drag components or even assemblies from any BOM to any other BOM, regardless of BOM type (Standard, Job, Order, Quote). Optionally, you can even include the Routings in those drags. Reduce the manually typing. When you do need to type, do it in an intuitive Excel-like interface. Use the arrow-keys and tab keys to navigate like in Excel. 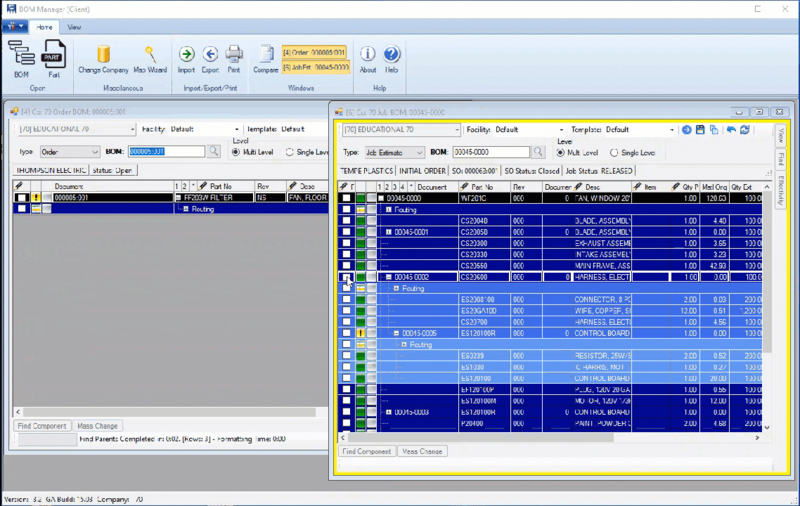 Edit the BOM and Routing information in the same screen. 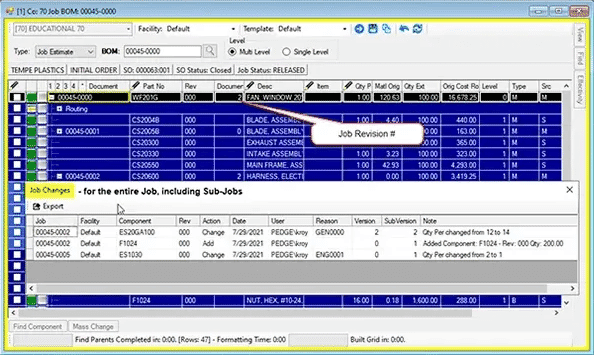 Want a complete duplicate of a Bill of Material and Routing into a new Part Revision? The BOM Manager does it in one step. Easily re-sequence routing steps back to 10, 20, 30, ..
Quickly update the Quote and Order BOM and Routing Costs with the existing current costs in Made2Manage. Provides the ability to create new Item Master Items for both End Items and Components. Allows the end user to create new parts with as little as 2 pieces of information. You can create as many templates as your organization needs, with specific defaults for each template. As with all areas of the BOM Manager, security controls access to this functionality. Any type of Excel, CSV or XML files are supported to Import from. Provides the ability to compare an Imported BOM before updating Made2Manage. A simple wizard allows the user to create new maps for new import sources. All imports are fully validated against Made2Manage requirements before importing. Warnings and Errors can be edited on the fly. Missing Item Masters can be added during the import process. Security controlled. Users can import to all of the Made2Manage BOM Types (Standard, Job, Order, and Quote).